Attention All: Self Serve Farm Stand! To keep veggies cool, they may be located in the blue and white cooler (that you see in the photo) when you arrive. Sunday through Friday, 9 am until dark: Drive up, choose your selection, reference the price sheet, calculate your total, and leave your payment, cash or check. (Or, if you are a Market Share CSA Member with a balance, just write down the $ amount for us to debit from your account.) We’ll announce when the Farm Stand offerings include our Bread! This is a temporary set up that we’ll use until our barn is constructed (planned for this winter). Next spring we plan to launch our Farm Stand in a permanent structure, protected from the weather, which will also house our Farmstead Bakery, providing the area’s most delicious bread to enjoy with our veggies. 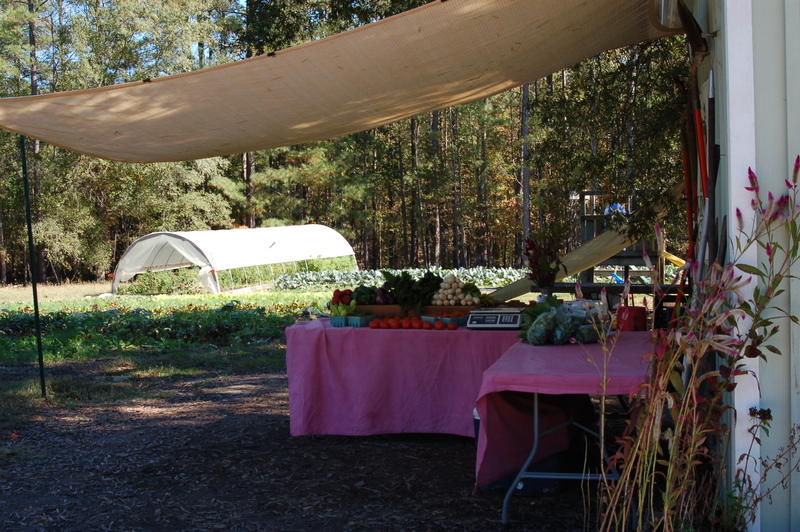 Stay tuned here on our blog (and on our Facebook page) for all updates about the In-the-Rough Farm Stand and the progress on the barn/farmstand/bakery structure. Our Farm Share Bag (consisting of the items in the Farm Share this week, in one easy to order option), Asian Greens (Pac/Bok Choi, Komatsuna, Yukina Savoy), Basil, Broccoli, Chard, Chinese Cabbage, “Regular” Cabbage, Cilantro, Collards, Eggplant, Escarole, Endive, Frisee, Garlic, Hearty Mix, Kale, Lettuce (red and green), Peppers (Bell, Padrone, Hungarian Wax, Anaheim, & Jalapeno), Salad Mix (limited), Spinach, Shiitake Mushrooms (limited), Tomatoes, Turnips (Hakurei) …plus Naturally Leavened, Hearth Baked Bread. 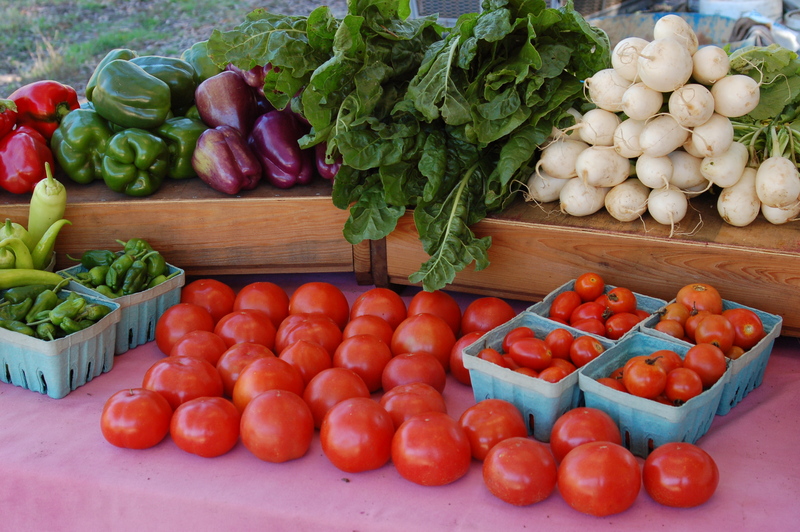 Our Recipe page is updated with suggestions for Greens, Collards, Turnips, and Tomatoes. Check it out! Wednesday, Oct 23rd, 1:00: Janet is speaking on a panel at a VCU Food Day Event, open to VCU students, faculty, and staff, about the environmental impacts of eating local food (and why we should all eat local, organic food). Put on by the VCU Wellness Center. Sunday, Oct 27th: Millwood School Bobcat Blast 5k! We will be there with our produce and bread. Race registration is open to the public. Events get rolling at 11 am. Join us! Coming up…Nov 7 and Nov 12, 6:30 pm: We are partnering with Good Health Herbs to offer two “Food Farmacy” classes at the herb shop. Learn more here.